Given that we're dealing with a tablet with plenty of space for audio hardware, and that even Motorola smartphones have been pretty impressive recently, we didn't expect anything, but a flawless performance from the XOOM in our audio quality test. The slate delivered, but you should keep in mind that Motorola pulled a similar stunt to what they did with the Atrix - the volume levels can be pushed beyond what the device can actually handle. So if you set the XOOM to maximum volume you might be slightly disappointed with the quality of its sound. 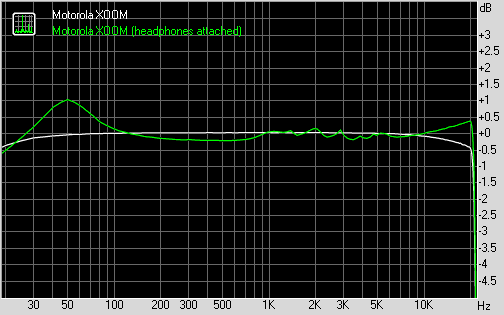 If you punch in the volume level all the way up you get really loud output but the dynamic range, signal-to-noise ratio and stereo crosstalk all suffer. That's why you would be better off lowering the volume a couple of steps down - you will be enjoying some impressively clean output, certainly comparable to the best we have seen. In that scenario the XOOM won't be as loud as you might expect a tablet to be, but just look at those numbers below. And even headphones don't take away too much from that. Even after the expected increase in stereo crosstalk, things are still looking pretty good when you plug in the headphones. You might not like however, the rise in intermodulation distortion and the slight hit that frequency response takes in the extreme low frequencies. The Motorola XOOM is one of best-featured tablets in terms of connectivity. Or at least one of the slates with the most potential as many of the options here still need a software update to become usable. You get a standard microUSB interface complete with USB host functionality. Unfortunately, you won’t be able to use it before the expected Android 3.1 Honeycomb update. Motorola chose not to enable charging through USB either, so you will need to keep the proprietary charger at hand at all times. Naturally, you get Wi-Fi and GPS radios and if you shelled out the extra cash for the 3G version, you will be able to experience 10.2 Mbps HSDPA and 5.76 Mbps HSUPA. The Verizon version is LTE enabled, but that too is to be unlocked with a software update at a later time. Another thing that needs an update to actually use is the microSD card slot. Right now the XOOM as it will simply fail to recognize your card. The good news is that when the update eventually rolls out, you will be able to get a large capacity memory card for much less than the premium needed to upgrade from the 16GB version to 32GB or 64GB. The last connectivity options worth mentioning are Bluetooth (with file transfer support) and the microHDMI port that allows high definition TV-out without an adapter. Chances are you will still need to get a new cable, but that’s usually the far cheaper option. The web browser is another key app as far as tablets are concerned. With a relatively good-looking interface and full Flash support, the XOOM sets off to a pretty good start taking an edge over the iPad. The tabs are kept in a bar on top, much like on a desktop browser and opening a new one is as easy as clicking the plus sign on the right. The address bar and search bar are, as usual for Android devices incorporated in a single field, which scores another point for the XOOM. Bookmarks have their own screen and history uses a split-screen interface letting you check the pages browsed today, yesterday or over the past week. There’s also a most visited tab. Now, for the Flash performance – the XOOM does okay with 360p videos right in the browser and 480p are watchable too (even if they do get slightly choppy at times). 720p Flash videos on the other hand are completely out of the question, though early reports suggest that the Android 3.1 update upgrades them to only mildly choppy. And this might have sounded good if it wasn’t for the fact that some Android smartphones are already doing 720p Flash and the Galaxy S II even manages 1080p. Obviously Motorola (or NVIDIA, we are not quite sure here) still has some catching up to do. And by the way, if you find Flash content to slow down your page load times or cause stutter when panning, you can switch it to on-demand in the settings menu (or even turn it off all together).